Weapons that failed. Bat Bombs – The alternative to the Atomic Bomb? Following our look at Body Armor in World War I, this month Adrian Burrows looks at a second bizarre warfare invention – the bat bomb. This was a weapon that was both odd and powerful. There have been many defining weapons in man’s military history, devices that for better or worse forever changed our view on the world and our place within it. However, this series of articles won’t be looking at any of these historically important moments; instead I choose to highlight the weird, peculiar and just plain daft inventions of war that are just so odd… that they had to have been real. So, what do I have for you this month? I give you… the Bat Bomb. First things first. I believe some clarification is in order. By Bat Bomb I do not mean the high tech compact explosive you would find on the utility belt of the caped crusader (Batman), no, I actually mean an incendiary device attached to a bat. The 1967 Batman Annual. Available here. This idea came to fruition in the midst of the Second World War and was the brainchild of a Pennsylvanian Dentist named Dr. Lytle S. Adams (yes, that Lytle S. Adams, none other than the inventor of the fried chicken dispensing machine). Recoiling from the shock and horror of the recent attack on Pearl Harbor by the Japanese, Adams came to consider ways in which America could strike back at its faraway foe. Dr. Adams knew that the vast majority of buildings at this time in Japan were constructed from paper, bamboo and other very flammable materials. He had also witnessed the behavior of bats during a recent holiday in New Mexico, particularly the manner in which the winged wonders found small crevices to shelter in during the day. Attach a bomb to the bats. Drop bats over Japanese cities. Bats spread out far and wide before finally hiding themselves in the dark recesses of buildings. After a period of time the bombs explode causing fires to spread rapidly across Japan creating chaos, panic, and destruction. Back to work… 10.45am. Patient. Root canal. It was certainly the case that Dr. Adams’ idea was unconventional; however, there were top bods in the American government who believed that despite the oddity of using flying mammals as an offensive weapon that the theory was sound. That the bat bomb actually could work. Adams submitted the idea to the White House in January 1942, where President Roosevelt himself authorized the further development of the project. It fell to the inventor of military napalm, Louis Fieser, to devise an effective bomb that was also light enough for the bat to carry. Fortunately for Fieser, bats can carry more than their own weight in flight, so the bomb he developed was roughly the same size as a bat and was an impressively diminutive sixteen grams in weight. Now that Fieser had bombs attached to bats, the next problem to overcome was to actually get all of them to Japan. And for this there was created an elegant and cunning solution. A device so simple and yet so genius I will write the details of it in its own paragraph. Yes, a big metal box with multiple compartments that could be used to house the hibernating bats. A parachute was stuck to the back so when it was dropped by a plane at high altitude over Japan, the descent of the box could be slowed. At 1,000 feet the bats were awoken from the hibernation; the compartments then opened and 1,000 bat bombs were released. If at this point you are thinking that I’m making it up (and who can blame you), then have a look at the big metal box in question. So, how come the bat bomb was never used? Well it was, although only as a test admittedly. 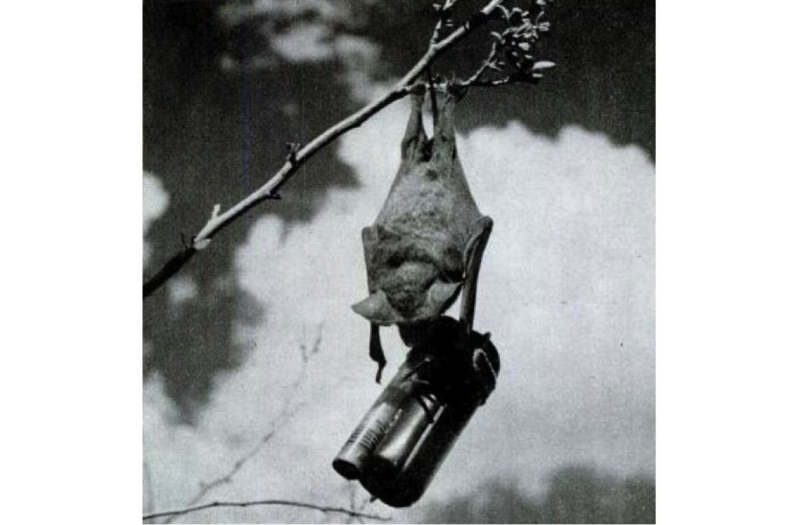 Even so, the military were very pleased with the results of the bat bomb when it was deployed on a mocked up Japanese village built in the Dugway Proving Grounds of Utah. Yes, there were some setbacks along the way (the bats set fire to Carlsbad Army Airfield Auxiliary Air Base when they roosted under a fuel tank, resulting in property damage and a high death count of bats). Nonetheless, the effectiveness of the bat bomb appeared to be promising. Not only that but bat loving mathematicians also surmised that ten B-24 bombers could carry over one million bats to their target. So, to ask the question again, how come the bat bomb was never used? Essentially the atomic bomb rendered it irrelevant. The new weapon was so devastating in its power and so terrifying in its annihilation of life that the bat bomb was consigned as a footnote in history. On the surface the bat bomb seemed like a ridiculous idea; after all, attaching explosive devices to any sort of animal seems like something you would watch in a cartoon. However, what if the bat bomb was used before the atomic bomb was dropped on Japan? What if this seemingly absurd weapon managed to bring a close to the Second World War? What kind of world would we live in if an atomic bomb had never been used on a civilian population? Think of thousands of fires breaking out simultaneously over a circle of forty miles in diameter for every bomb dropped. Japan could have been devastated, yet with small loss of life. Adrian Burrows works for Wicked Workshops, an organization that brings historical workshops to primary schools across the UK. They are currently delivering many workshops about World War I. Click here to find out more about this great organization. Want to read more? Well, here is an article on the Cold War and World War III. Newer:The many wives of King Henry VIII – Images of the WeekOlder:The Bat! But what will be next?